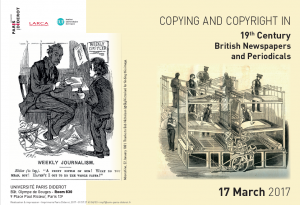 La st week, Université Paris Diderot hosted a conference exploring the copyright issues raised by periodicals and newspapers in the nineteenth century. Drawing together scholars working in law and the humanities, the conference involved a shift away from the usual focus of copyright history scholarship on books. The wide-ranging programme, spanning papers on attribution patterns, customs of reprinting and re-use, as well as nineteenth century debates on copyright in news, included a paper by CREATe researcher, Dr Elena Cooper, exploring the interface between nineteenth century copyright rules regulating encyclopedias and periodicals, and the underlying social understandings of those genres. The full programme, which is available here, will lead to a special issue publication in Victorian Periodicals Review. More about the conference, organised by Dr Will Slauter, can be found here.